Johnakan Ur-El: I am Johnakan, and after my message I will give place to the Master Ron so that he gives his opinion about several topics. I want to say first that in the vibrational plane 5, we no longer have a personality, because personality is generally "tethered" to Ego. But there are certain peculiarities to say it somehow that distinguish a spirit from another. For example the Master Ron is a little bit more impulsive and more straightforward than I am, Kether, the Ancient of days who was named Planetary Logos twice and at the moment he is embodied in the planet Ani, he is a little bit sharp in his ideas and that is not bad; Rah, from Antares 4 is a being with a very sweet voice, the same as my dear Master Jesus, and Tar, the “Messenger of the eons” who embodied in the Earth in Egypt like Thot (Hermes Trismegistus) is very strict in his messages. I want to explain that I, as a spiritual entity and Thetan of this vessel, I am embodied in a 10% in this vessel, but now the one who is speaking is the 90% remaining who is in the plane 5 of spiritual vibration. Interlocutor: Isn’t talking the 100%? Johnakan Ur-El: No, not the 100%, but 90% at this time. But what I want to transmit to those who don't understand mediumship, is that the spirit gives concepts, ideas and not words. The word is being lucubrated by the medium, and the medium can only transmit a certain percentage of the idea or the concept that the spirits wants to give, according to the mediumship capacity and other factors, like the knowledge, engrams and the preconceptions the medium has. If my spiritual part communicated with another spiritual part, like Ron, Jesus, or Lao Tse, perhaps in a single idea, in few seconds, we could transmit what you transmit in one hour or more in a dialogue of yours. Do you understand what I mean? Johnakan Ur-El: But to take the message to the earthly language it is necessary to "filter it", and many times it doesn't filter completely well. For that reason, when my incarnated part, Jorge Olguin, makes the corrections, he evaluates things that can be eliminated, things that can be added, correcting always for good so that those who will read the message have a better interpretation of the message transmitted. Johnakan Ur-El: This doesn’t mean that this vessel is not a good medium, of course not, because his transmission which is about a 90 or 95% of accuracy can be considered something really exceptional, an unique case on the planet Earth. Another thing that I want to explain is that some mediums channel erroneously, because they consider that if they channel a Chinese character, they have to transmit it as if the entity were Chinese, that is to say making stress in the special accent of that language. A transmission like that only emphasizes what should be avoided, because as a matter of fact what is being transmitted is the idea, the concept, and not other things. Interlocutor: Concretely, emphasizing the idiomatic accent is bad in mediumship? I ask it because one of the previous mediums, in an opportunity channeled Confucius and he spoke with Chinese accent. Johnakan Ur-El: It’s not in me to judge those who transmit in that way, I only say that it is unnecessary and it doesn’t add anything to the accuracy of the transmission, and it can even give place to confusion in those who listen to the messages, because a spirit embodies ten or a hundred times or more and there would not be any special reason so that the spirit use an accent of a language of some of the incarnations, although it were one of the well known incarnations like the case of Confucius. Interlocutor: This was perfectly clear. Johnakan Ur-El: I will give place to my dear brother Ron now. I greet you with all my blessings. Interlocutor: See you later, Johnakan, and thank you. Are you already incorporated, Master Ron? Interlocutor: How are you, Master, It’s been a long time? You were like absent. Ron Hubbard: One is never absent from those one loves, and this is a metaphor, we are never absent from the universe known. Before we start, I wanted to remind you that the Spirits of Light of the planes 4 and 5, communicate with entities that suffer from the planes 2 and 3 who are spirits of error, whose ego is so big that it makes them resentful, easily offended, then we go to comfort them. Interlocutor: How do you arrive to those levels? Ron Hubbard: We descend. descending it’s a way to say it since we “become denser", to communicate with those entities. Just like you, -and this was already said by me in one of the first sessions-. In the physical plane you cannot see, except only those who have a paranormal vision to the spiritual entities, the spirits of the plane 2 cannot see those of the plane 3, those of the plane 3 cannot see those of the plane 4 and so forth. Actually, we don’t "see" each other, because saying “to see” is only a way to express it, because in the spiritual planes we don’t see with eyes, since we don’t have eyes. In the spiritual planes there is another type of vision which is much wider. Besides, we perceive ourselves as traces of light. When we descend, we communicate somehow with their minds and we give them comfort, we send them Light, in order to make a little more pleasant their condition. Interlocutor: Do you suffer in that kind of communication? Ron Hubbard: Always, because we share isolation. Ego makes many misdoings. There are spirits who want to subdue others. And I say this in earthly terms, those who “vampirize” to others, those who lock themselves up and don't want to communicate. The spirit doesn't have age; however they behave like earthly creatures. This is what I wanted to say. Now we can continue with the questions. Maria A: My name is Maria A. and I wanted to ask you if in the field of literary arts, I am well guided and if it is part of my mission. Ron Hubbard: You should not stop what you are doing because is very beautiful for yourself. Don’t believe that flattering oneself is a lack of spirituality. Sometimes One should have incentives, because even in the plane 5 there are incentives. For example, we motivate ourselves when we see that there are beings of the plane 2 that grow up spiritually and they go changing from planes towards subtler vibratory planes. On the contrary what a little incentive is to observe that there are thousands and thousands of spirits of error that listen to us and in spite of that, they don’t pay attention of our teachings! We are not offended, because we don’t have ego, so there is no way to hurt us. Although, there is kind of discouragement. If you allow me that expression. When we see that the result we have it is very scarce. Returning to your case, what you are doing, it’s beautiful for yourself, besides it is Service to the others, because all kind of writing which later on is read by other people, influences in their growth. Maria A.: Can I ask one more question? Ron Hubbard: Yes, go ahead. Maria A.: In this mission, will I receive help from higher Entities? Ron Hubbard: I perceive at telepathic level that you are already receiving help from several Entities. Maria A.: How am I receiving that help? Ron Hubbard: You can receive help in your causal body or body of ideas. You know it because, for example, in a given moment you have an unfinished topic that would take a long time to solve and suddenly the answer comes to your mind in a moment. This means that it was influenced in you somehow, but this should not be interpreted as if the Entities will make all the work for you. Sometimes you may have a kind of "push". And in the future you will still have more support. Maria A.: Another question I have is: What is the difference between Transpersonal Psychology that I have studied about, and the technique developed by professor Jorge Olguin called Psychointegration. Ron Hubbard: I will say it for Johnakan, who is the one that has developed Psychointegration. I translate it: When one is more integrated to another spirit and more knowledge one has about the soul, whether human or from other beings from other systems in our galaxy or other galaxies, the more one realizes that the other beings have still to be elevated, and then the more one suffers. One cannot stop feeling pain for the suffering of those beings. The only way that one has to not suffer is detaching oneself. But this must not be misunderstood. Detaching or like my vessel says, not needing, doesn't mean not to worry about the others, but having more time to give to the others, since this is the most important thing. It doesn’t mean "indifference", but just the opposite, "having more time to give Love"
Interlocutor: Another question is if Psychointegration is good for everyone or for some only Dianetics works and for others Scientology. Ron Hubbard: In the physical plane the Sabin vaccine was discovered. What do I need if I am six months of age, Sabin or Salk? Ron Hubbard: Then, if I can receive drops of Sabin, Why would I apply myself Salk vaccine in the back? Besides I inform you that I applied it when I was incarnated. That is to say, Why is it necessary to use any other treatment having Psychointegration at hand, If we know that the source of suffering is ignorance and ego and this technique is ideal for that? To conclude, if we know that in all the spirits.-in everyone -, the reactive mind is there, and if we know that integrating the “selves”, integrating the Ego, there is no way to have engrams, for that reason, Why will we look for another method if dissolving and integrating the ego we solve the problem? Ron Hubbard: Mankind is not prepared for Psychointegration yet! We know that 90% of people make Freudian Psychoanalysis, Lacanian Psychoanalysis, and conversing with disembodied Entities, big Masters of Psychology, they themselves recognize that eliminating that attachment makes unnecessary any psychological help capable to dissolve any trauma, because there is no way to sow traumas where there is no ego. It would be as if you in the physical plane wanted to sow a plant on the pavement. Which means that Dianetics and Scientology were necessary -and they are still are-, because inside the incarnated plane, and while we go evolving, the human race is not prepared properly for Psychointegration yet, because this technique implies to stop being the main character, to grant the prominence to the other. Interlocutor: I know, in my own experience that it’s very difficult thing to achieve that. Ron Hubbard: Notice that in the physical plane there are Kindergarten, preschool, first grades, High School, university and the graduate degrees. And as well as there are people, and I say this with supreme respect for all the beliefs that according to their idiosyncrasy or needs go to the cult that you call here evangelical for example, and in other countries it is called Protestant or Lutheran; there are other people that also according to their idiosyncrasy or needs, they go to the Catholic cult or the Spiritualistic cults. Ron Hubbard: We will speak about the evangelicals. They, with a Pastor who says Hallelujah! are already happy. But this would not help you, because it is as if you were an algebra teacher and they wanted to teach you how to add. Obviously you would say: But please, I already passed that! One cannot teach to add to a professor of Trigonometry, but to other people this would help them. Interlocutor: This is clear, Master. Now, I would like you to explain a little, if it is possible, about the system of auditing of Psychointegration. Ron Hubbard: In fact, Psychointegration is not auditing. What Psychointegration makes is that every “self” that is dispersed recovers his true function adapting himself in the reactive mind, so that this mind is analytic. What one is looking for is to dissolve or transmute that ego. When transmuting that ego there is no longer a fertile field for engrams. With psychointegration a person is not audited. With Psychointegration it is as if it were transpersonal Psychology, but somehow making the person see that he should not need that he should have all the time to give. The important thing is not to be the main character. That person who is not the main character will not be hurt by anything, nobody will hurt him, he won't be easily offended and therefore his engrams will disappear, because engrams appear when there is prominence. Interlocutor: Could we give a valid example by saying that Psychointegration is a treatment that makes a “barren land” so that no engram grows up again, instead of pulling the engrams up like Dianetics does? Ron Hubbard: The example is valid to be understood, although it is not very exact completely. I repeat that it’s not an auditing, not even of Psychoauditing which is the auditing of the Thetan. It is something deeper and simpler at the same time. It is trying to stop playing the lead. What happens is that when one is incarnated it is very difficult to stop playing the roles. Everything is prominence. Prominence is when one feels admired by the other. Prominence is when one has a title. In the real Service there are no titles, there is no mother, father, doctor, or psychologist, not even a friend. We are all Servants. We put the titles because we are in a society where somehow we need them, but we don't have to take this way so seriously. Somehow, if my vessel is a doctor, he is a doctor for the others, but not for himself. Interlocutor: In the case of Oscar S. Would Psychoauditing help him for example I mean the direct auditing to his Thetan? Ron Hubbard: It could be useful the auditing to his Thetan, but only if Oscar accepts to be treated with Psychointegration, I consider preferable this technique to his incarnated part instead of Psychoauditing to his Thetan. I consider that all the Paths of Light are valid and those who fail are the human beings and not the paths. I will give a short example before leaving because the vessel is very tired. One of the most important currents in the Planet is Sufism, they are based in 50% by their beliefs and in other 50% by their anecdotes that are so wise that they deserve, to say it somehow, . "Reverence", "I take my hat off to you", as you say on behalf of those who are in the path. However, in most of the countries where philosophy is practiced, the ignorance of their inhabitants is total, with such a big attachment and some enormous desires for power, added to an enormous indifference to the pain of others. Just like the countries where Buddhism is practiced, which is one of the most important philosophies on the planet. And they reach the point of perversity amputating the hand of their babies just to request charity. What kind of Buddhists are they? What kind of Muslims are they?, what kind of hindus are they? We, when we are incarnated, we love our children with a personal love, and it is not bad because they are stages. When I was embodied I also loved in a personal way to many people. This personal love is something natural in the human beings, and for that reason we find very difficult to conceive that somebody can have such an unnatural, so loathsome behavior. What so cruel spirit is the one that is inside of those vessels so that they cripple their own children amputating their members so that they inspire more pity to the pedestrians obtaining in this way some more miserable rupees? Well, they practice philosophies like Sufism, Buddhism, Brahmanism, called Hinduism! The brother of Light Mahatma Gandhi said in an opportunity: “I love Christian philosophy, but I am disappointed of the Christians” And I, Ron, as for myself I say: “I love oriental philosophy, but I am disappointed of orientals." Obviously, it is a figurative way to express it, because I love all of them, but I want them to understand the paradox that very high philosophies can be desecrated by their followers. The problem, therefore, As I already said, are not the spiritual guidelines, but those who practice them. In one of the first messages that were given three years ago, it was said that there are Masters that are so mistaken that instead of summoning so that they revere the Creator, they summon to be revered themselves. That is the big mistake, because what a Master of Light has to practice above all things is Humbleness and Service, and that is not made by Western traditional religions, they want to be served. They put themselves on a kind of an imaginary or physical pedestal, and they literally made themselves adored by their parishioners, and they go like a livestock to adore them, forgetting the Father who is the one they should look at. The vessel is very tired and he finds very hard to translate my ideas. Interlocutor: Everything is very clear, Master, it’s not necessary to deepen more in the topic. To conclude this session, what spirits are present? 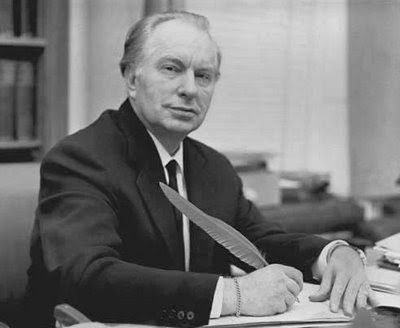 Ron Hubbard: The Master Jesus, the Masters Siddhartha, Lao Tse, Confucius, Djwal Khul, Blavatsky, Serapis, Kwan Yin, Nagarjuna. I want to say a word regarding Nagarjuna. Nagarjuna is one of the biggest philosophers of all times, reaching the culmination with his theory of emptiness. I would like you to look for that theory and see how beautiful it is. Interlocutor: We will do it. Ron Hubbard: My blessings for all of you. This entry was posted at Wednesday, December 02, 2009 and is filed under Messages of Light . You can follow any responses to this entry through the .